Watch for traffic on your right. 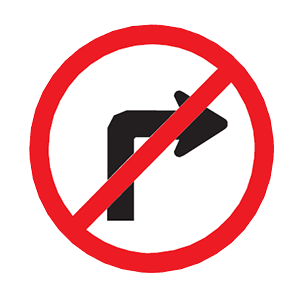 This sign prohibits right turns. You cannot make a right turn at an intersection where this sign is posted. Must not pass another vehicle. May pass a slow-moving vehicle if you can do so quickly. May pass if you know the road ahead. May pass, but only at night. Regulatory signs are white, rectangular signs with black markings. Drivers must obey the instructions posted on all regulatory signs. 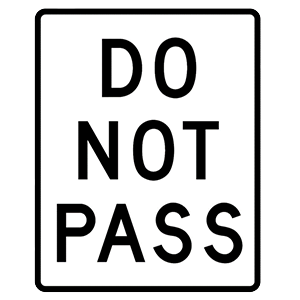 Where this sign is posted, it is prohibited for drivers to pass one another. At or near the speed of traffic on the freeway. Five to 10 mph slower than the speed of traffic on the freeway. The posted speed limit for freeway traffic. 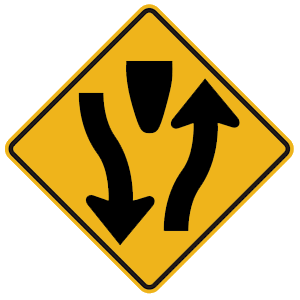 When merging onto a freeway, you should enter at or near the speed of traffic.